With government cuts threatening just about everything culturally fun and useful, such as art galleries and museums, the issue that is causing me my current heartache is the potential slashing of libraries and books throughout the UK. I say slashing, because that is what I see. In my mind. Picture this; a massive government hand swooping down from the sky, scythe in tow, and attacking. Paper and brick fly asunder. It’s gruesome. What’s worse is that whilst over 370 national libraries face closure or cuts, the government’s cutting criteria seems somewhat biased, aiming the severest hacks at those visited by a lesser volume of people. So regardless of how important a library may be to a small village, due to the lack of public buildings or low income, their libraries could be hit the hardest. And this is happening all over the country. You just have to see the map of the library closures to see that this is a serious problem. Children’s author, Helena Pielichaty explained that villages without public spaces except from pubs (and how often can one go there without people thinking you have a problem), the library is regarded as not only a cultural and educational sphere, but gives individuals and groups the opportunity to gather there for discussions and organisations. If the slashed opening hours go through, the users will not be the only ones to suffer; the librarians will be at a loss, too. With libraries becoming less available, children and adults will no longer have access to reading materials, those without access to PCs will become digitally excluded, overseas students will find it harder to contact home and levels of litaracy may well decline. But there is something we can do. Take a leaf out of Ross Bradshaw’s (of Five Leaves) book, who organised a letter to the council signed by 100 writers, academics and booksellers pledging their support to stop the cuts. Or follow the lead of Calderdale and Wirral whose protests have seen a reversal of planned library closures. The more we protest to our council, the more they have to take notice. So, write to your MP’s, stage a protest, dress as a book and parade around the streets. We can’t let them close our libraries. As Sir Andrew Motion, former poet laureate said, libraries are the places “you go into to discover yourself and the world. 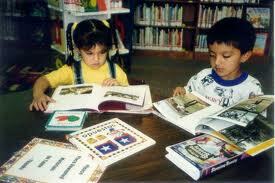 They are a vital part of every community, providing avenues of learning that goes far beyond books.” They must be saved. Without wishing to go all Martin Luther, I have a dream that protests and petitions to stop library cuts will spread throughout the country like orange juice on kitchen roll. But we need to do this together. So listen up. Oxfordshire, I speak to you. There’s a chance you may lose 20 out of 43 of your libraries. Think of the children. Northern Ireland, hear me. Think of the knock on effect of losing ten libraries, it’s enough to turn you to drink. Brent, open your eyes to the fact that 6 out of 12, that’s HALF, of your libraries are under threat. Plus, one of the planned closures is Kensal Rise Library which was opened by Mark Twain in 1900. And as the man himself said, “apparently there is nothing that cannot happen today”; so let’s keep those libraries open, if not for ourselves, for our children. After all, with depleting numbers of tuna, there’s a chance future generations will have no knowledge of the fish; let’s not allow them to miss out on anything else. Voices for the Library , a pro-public library website for everyone who needs and uses the library and who they should remain open. 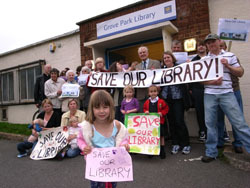 Public Library News, a survey of public libraries under threat in the UK. Show you support and write to your local council or newspaper, like Helena Pielichaty, a children’s writer who is adamant that libraries should not be cut or closed. Posted in Uncategorized and tagged amelia murray, arts council, cuts, helena pielichaty, kensal rise, library closure, mark twain, poet laureate, sir andrew motion. Bookmark the permalink.